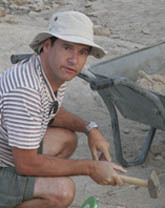 Gwyn Davies is Associate Professor with the History Department of Florida International University, and holds his degrees from the Institute of Archaeology, University College London (Ph.D., M.Res., B.A. ), Vrije Universiteit Brussel (LL.M. ), and University College Wales (LL.B.). He is the co-director of the Yotvata Roman Fort Project, Israel, and his areas of specialization include Roman siege works. He has published extensively, and current projects include The 2003-2007 Excavations in the Late Roman Fort at Yotvata (with J. Magness, Eisenbrauns), and "Siege Warfare 27 BC- AD 295" in The Encyclopedia of the Roman Army (Wiley-Blackwell).